I’ve been trying to cook more often; I don’t really have a lot of time, but sometimes I have to (food going off, tiny lunch etc.). I love cooking, but finding time to go shopping and buy healthy ingredients during busy season (I’m an auditor, so from no until May it’s pretty much non-stop!) is impossible! But, despite all that, last night I managed a delicious, vaguely healthy, far too big meal just for me. The amount of pasta probably would have suited two people, but the canteen lunch I had yesterday was so underwhelming and small that I was ravenous by the time I got home. 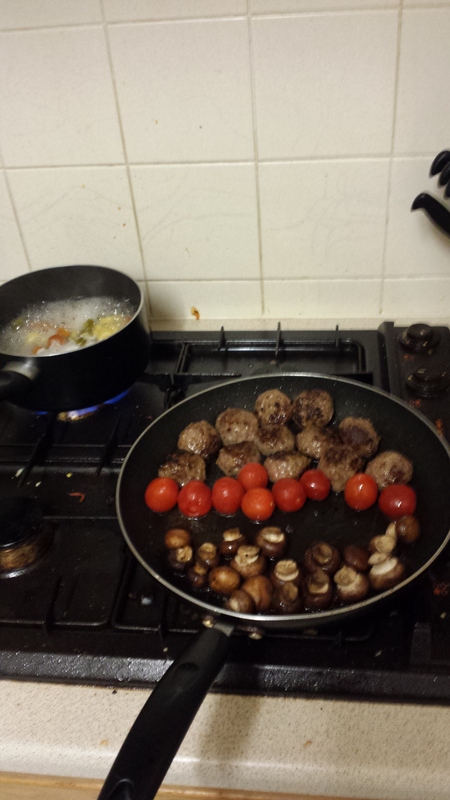 I started with the knowledge that the meatballs were going out of date, and I had a pack of baby button mushrooms and on-the-vine tomatoes that needed eating up. You might not be able to see easily in the picture above, but the pasta boiling away above is Tricolor Torchio, which I picked up from Sainsbury’s a while ago. The problem with using Tricolour pasta is that it can easily lose that colour, or at least any brightness. This is really obvious if you mix your pasta directly with sauce, rather than pouring it on top. Well, I’m a fan of big one-pot dishes (see blupdates passim ad nauseam), so I like to mix mine all up; that way, you get sauce on every bit of the pasta. The finished article is below. It may not look particularly pretty, but my goodness it tasted good. 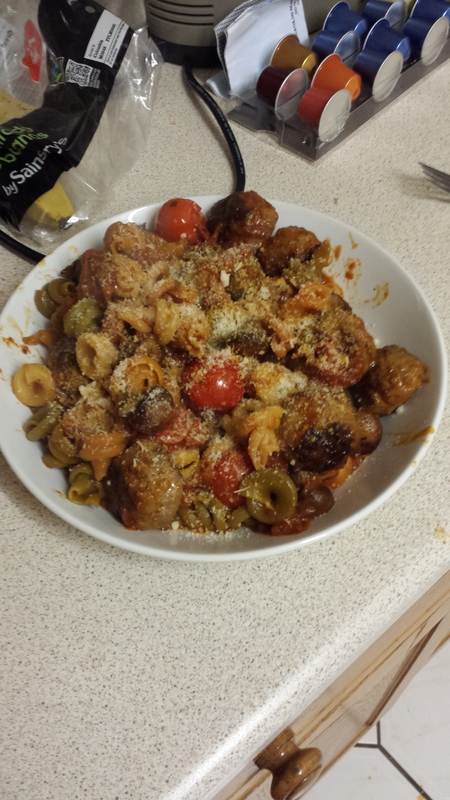 This is a meatball, tomato and mushroom pasta in a sundried tomato sauce, covered in parmesan. Hey Chris, thanks for stopping by. Your comments made me laugh because I think most cooking-for-ones are in the same boat. I’m starting to post weekly meal plans/recipes you should keep an eye out for if you’re interested! Wonderful colors. Thank you for liking my post..